This is an unexpected pen from a maker I associate with very cheap pens. It’s not an expensive pen, to be sure, but it has a rather more complicated filler than the press-bar most Wing Sungs of my experience have been fitted with. Although, to be complete, it is fitted with one of two more complicated fillers. I’ll return to this in a bit. The initial batch was a more than usually faithful reproduction of the last Vacumatic-filling Parker “51”… including the filler. The only obvious difference between the Parker and this pen is a band of ink-windows similar to those on the Sheaffer Compact, which are to my way of thinking a real improvement on the original. Wing Sung is not, sadly, given to press releases, so it is unclear why they went down this path, but it is a very interesting entry-point for someone who is vintage-curious, but not ready to commit to the expense of a restored seventy-year-old pen. From the point of view of maintenance, there is another design improvement; the filler can be removed with a simple adjustable spanner, rather than demanding a specialized tool for the job. There is, alas, Wing Sung’s ongoing struggle with quality control to be considered, which is compounded by the fact that it seems the pen was not really out of the prototype stage when it went on the market. Early buyers reported seal failures at the hood joint, and I know of one who found the filler had failed and was not able to extract it without damage. These reports are not extremely numerous, though, and most user reports I’ve seen suggest contentment in accord with the amount of money spent, which is somewhere between a fifth and a tenth of what one might expect to pay for a functional “51” Vac. My own experience with this pen is of the latter sort. The instructions seem (as I can read only about 15 Chinese characters) to indicate the user is expected to remove the hood for cleaning, which will render that less of a chore than in the Parker, and having had the hood off before filling, I have not run into any leaks. There is the bugbear of Chinese pens, drying out between uses, which appears in the 601 as well, although I have found mine to be a little more willing to get back to work after an idle week than many of my Chinese pens. The combination of a large capacity and an extra-fine point (so far as I can discover, the only size available) makes for good endurance, and the point is as smooth as one can reasonably expect from such a narrow tip. As the 601 enters its second half-year of production, there seem to be a swarm of variants appearing. Some lack ink windows, which I find baffling. Some have an entirely different filler mechanism, although they still work on the Vacumatic principle. The diaphragm is replaced with the head of a piston which sweeps the same volume as the travel of the plunger*, and which requires multiple cycles for a complete fill. I find myself wondering if this isn’t an engineering solution to the question of replacement diaphragms– I don’t know if the ones used by this pen are one of the three sizes used in Parkers– but I think I would suggest the plunger mechanism over the diaphragm as less likely to fail. For those who are contemplating the possibility of using either mechanism in the 601 as a replacement for a gutted Parker, I offer only disappointment. It may be possible to use some elements like the plunger or spring, but the mechanism as a whole would not suit a Parker body. Leaving aside for the moment whether the threads on the unit would match the barrel, the Parker units carry the threads that hold in the blind cap in place. In this pen, those threads are on the inside of the barrel; a Parker blind cap would need a whole new set of threads machined onto its outer surface, and if you can do that, you can probably make your own Vacumatic removal tool. *In my example of the piston version, the piston’s travel is arrested by the end of the breather tube which is, to those who have opened Vacumatics, oddly long. I don’t know if this is consistent across all examples of this version, but I have two observations to offer. First, it seems to allow for very full filling, relative to what I’m used to in a Vacumatic pen; when filling ends, there is very little air left. Second, pressing firmly on the filler stem transmits force through the tube, and ends up shoving the feed out the front of the pen. This is non-fatal, but it’s inconvenient, so press gently. Production Run: Introduced in late 2017. Cost When New: $16.50 on a reliable eBay seller; some appear for less. Size: 14.0 cm long capped, 14.9 cm posted, 13.0 cm uncapped. Filler: Vacumatic, capacity approx. 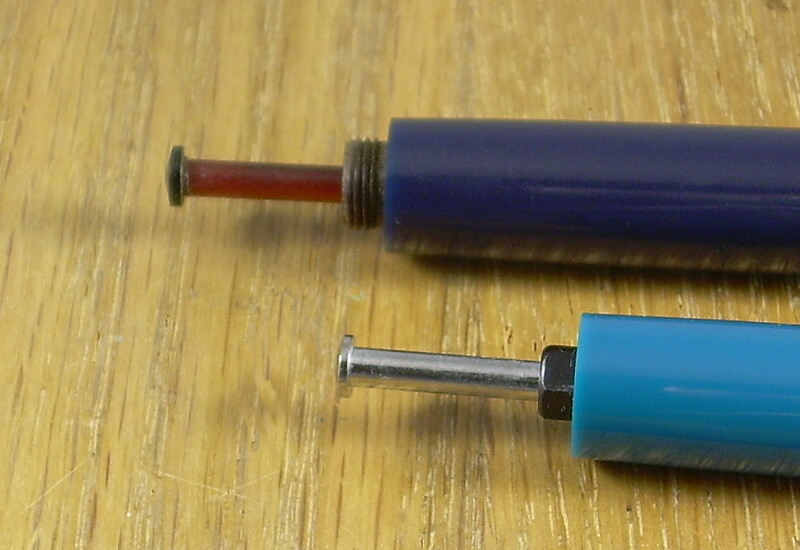 1.2 ml with diaphragm, 1.7ml with piston. Wing Sung 601. If not for the ink windows, you’d be forgiven for thinking it was a Parker “51” of unusual colour. With the cap on, it’s EVEN HARDER to tell that it’s not an older Parker. Demonstrator version of the 601, which at least initially is the only form one can get the piston-style filler in. Notice that there is an o-ring sealing the hood, which is very easy to remove. The mechanism, with the later style of Parker’s version in the background. You see the threads on the Parker? That’s at least one reason they’re not interchangeable.